Once again, ME LIKE EAT is proud to offer you the thoughts of contributor Hugh, this time taking on one of the most popular and storied restaurants in town, Minetta Tavern. Editor’s note: this is the first and only post on this blog to use some Photoshop-enhanced images in an effort to make the barely visible scene within moreso. Windows are always shuttered. What lurks within? Minetta Tavern is proof beyond any doubt that Adam Smith was wrong. How about that for a truly original thought? Now where is my Nobel Prize? My memories of college economics classes are vague and hazy. But through the mist and cobwebs, I recall being taught that Adam Smith theorized that in the market economy there is this invisible hand out there that guides the basic forces of human interaction on this planet. According to Smith’s theory, if people demand something, its value increases. Applying Smith’s theory, a good restaurant is in greater demand, and therefore is more expensive. That is why many of us will pay more to dine at a good restaurant, like a Jean-Georges, Keens, or Quatorze Bis., than we might to eat at, say, a McDonalds. If you believe in Adam Smith’s theorem, the invisible hand should not allow a Manhattan restaurant to charge Peter Luger prices for lousy food to remain extant on the planet for long. 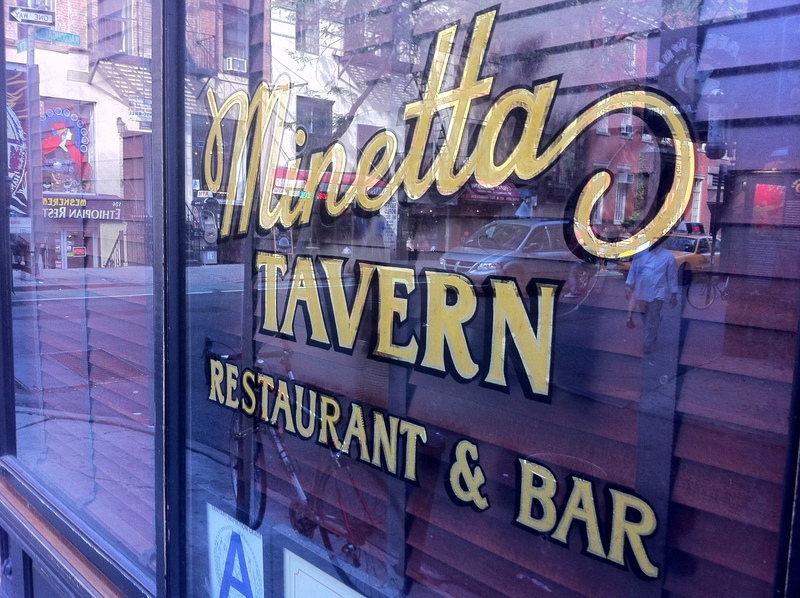 Indeed, if Smith’s theory is correct, Minetta Tavern is due the back of that invisible hand. So what makes Minetta Tavern the popular destination restaurant it seems to be? Why did The New York Times’ former food critic Frank Bruni suggest that it might be the best steak house in New York? Especially in one of the most competitive cities on the planet when it comes to food. A place where great and talented chefs, each apply so much of their talent, wit and skill, to get a good review in The Times, a 27 in Zagats, or a Michelin Star. A City where countless restaurateurs fail, and good restaurants are shuttered. I’m sure most of you have seen this happen. And the stories of these failures are routinely awful. Some courageous individual sinks it all into an enterprise, and then gets to watch as his or her dreams get dashed against the rocks. This happens frequently and pitilessly, notwithstanding talent, drive, and even the quality of food. Yet in this unforgiving maelstrom of supply, demand and Adam Smith’s invisible hand, Minetta Tavern stubbornly persists and appears to thrive. It makes my head hurt to think about it. So, how does Minetta Tavern work? 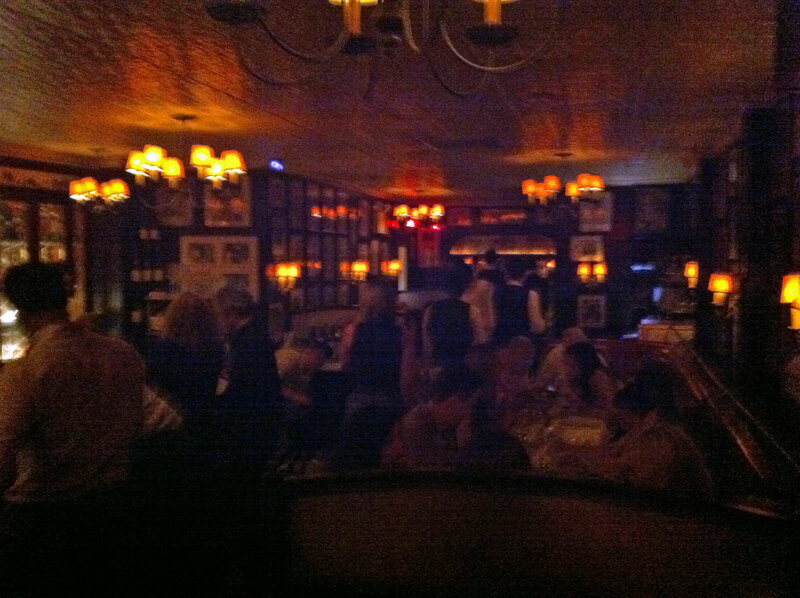 The permanently crowded bar area of Minetta Tavern. 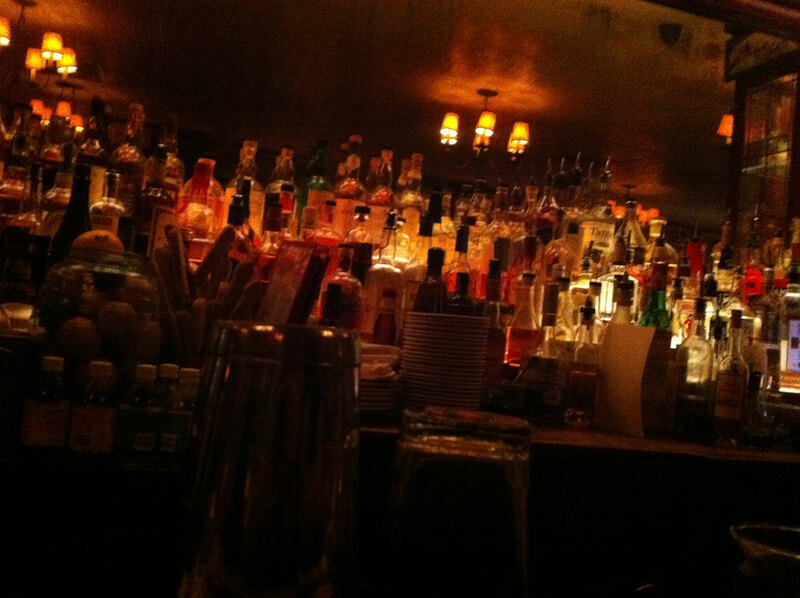 On my recent visit, Minetta Tavern was crowded. It had a cheery buzz of a crowd eating and drinking to the subdued sounds of Frank Sinatra. The sardine appetizer was dry, salty, lemony, and very tart – all at once. It left me confused. The shrimp salad was handful of rock hard shrimps served over “wild arugala.” Wild arugala is a variety of lettuce, except each leaf is ringed by prickly, throat-scratching thorns. Minetta Tavern’s signature steak is a Cote de Bouef for two. That is a big Ribeye to those of you who do not parlez Francais. Ribeyes are a very fat filled cut of meat, and if properly served, the fat liquefies as you bite into it, and it enriches and sweetens the flavor of the meat. 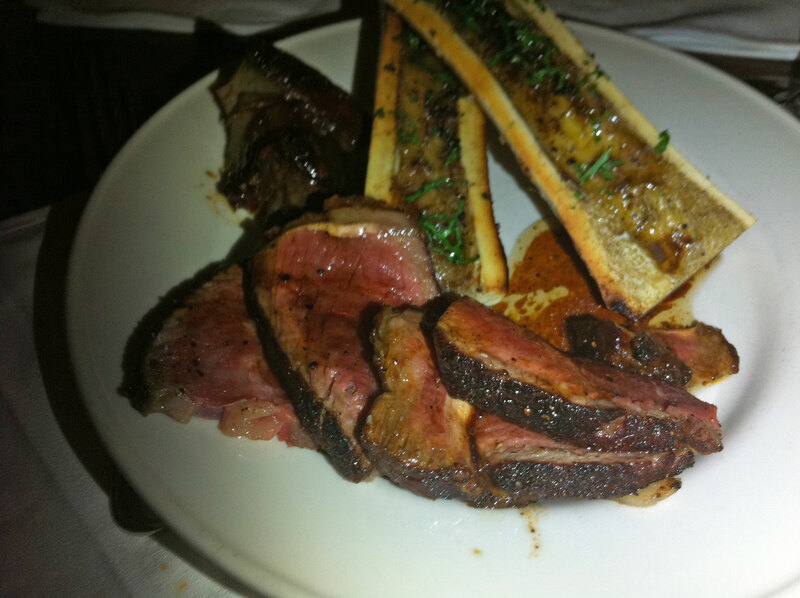 A portion of the dry-aged, signature Cote de Bouef for two. $118. Minetta Tavern’s Ribeye is ridden with the chewy, hard to swallow kind of fat – the kind that’s expertly designed to make you choke. I am confident I have eaten better steaks at my local Greek diner. The steak was served with hollowed out bones, within which was this goopy, luke warm, gelatinous textured marrow. In a word: nauseating. Although saturated with oil, the Pommes Anna was the best thing I ate on my most recent visit. It is a pie of sliced fried potatoes, with slices ranging from sopping-wet soggy to stiff and brittle. In this mix, however, there were a few which worked. The wine list is a doozy. It is one of those wine lists with one or two inexpensive options per column. You know, the kind of wine list where if you order a less expensive bottle of wine, you ordered the cheap wine. A steakhouse is theoretically, a straightforward thing. Steak is a simple comfort food. But do you go to a steakhouse for a cut of beef of a kind and quality which most of us non-executive chef types cannot procure or make at home even if we had the desire to do so? Or do you go for the atmosphere? That “harrumph harrumphing” that occurs when you are surrounded by people who are taking a mini-vacation from the travails of the big city, to enjoy one of its more reliable benefits. I think most of us go for both reasons. Minetta Tavern has plenty of atmosphere. But the atmosphere at Minetta Tavern is different than that of a steakhouse. Or even a restaurant. Minetta Tavern is a scene. Minetta Tavern is the one steakhouse in New York where you will definitely find gorgeous women. Amazingly beautiful women throng to the place. The first time I ate there, a really beautiful woman whom I never met before – sitting at the bar perhaps ten feet away from my table – while the poor guy who she was dining with was not looking, flashed a naked breast at me a few times. I had a fun experience there that night. Except for the food. But what do these gorgeous women know about Minetta Tavern? Why do they go? Could it just be the location? Greenwich Village? Downtownland? Coolville? The place where restaurants seem to automatically get better reviews than all other parts of town? So there is something in the local waters of Coolville which renders Minetta Tavern a great steakhouse. If you drink those local waters enough, you would know. It could be just that simple. Because that area is so cool, and Minetta Tavern is one of the limited options in that area, Minetta Tavern becomes a great steakhouse. Even though the steaks they serve may try to choke you to death. That theory doesn’t scan. Adam Smith’s invisible hand smote many other Village standards. Another theory must apply. So I have developed one. 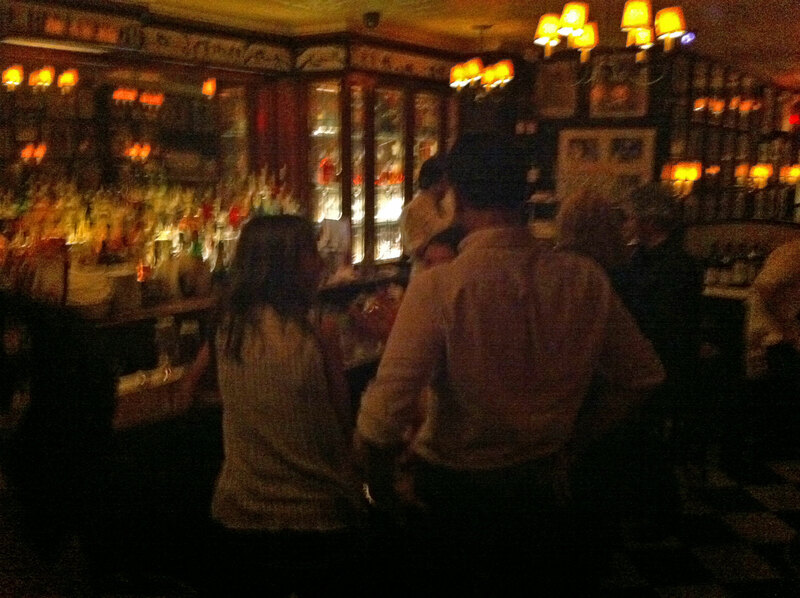 More of the bar scene at Minetta Tavern. Through the miracle of public relations, the owners of Minetta Tavern have created an uber-expensive, uber-chi-chi, uber-hard-to-get-into restaurant which cannot fry a potato. They picked a great location in a hip and happening part of town. That helps. It attracts celebrities maybe. If my theory is right, and Adam Smith’s theory is wrong, does this mean that we are all just saps? Adam Smith’s invisible hand controls the happenings in the market, but every so often, due to my “Big Sap” theory, the invisible hand gets a place like Minetta Tavern totally wrong. Instead of swatting Minetta Tavern down, the invisible hand puffs it up. I think I am performing a public service by notifying the world that places like Minetta Tavern exist. They are out there. You run into them from time to time. A place where you are the big sap for going. Welcome to Coolsville, Big Sappy - I mean, Daddy. Restaurants like Minetta Tavern simultaneously give a black eye to every great restaurateur out there, who built a worthy establishment, and to all of the restaurateurs who took that shot and failed because of the inherent brutality of the restaurant business in New York City. So, will the Invisible Hand figure it out? I hope, at some point, it will. The problem with the Big Sap theory is that a special kind of disappointment sweeps across my soul, and it feels like it takes years off the back end of my life, when I pay through the nose for lousy food. Nobody likes to admit they got took. It’s embarrassing. But, after I went to Minetta Tavern I felt like I got took. I felt like a big sap. And to me that’s the ultimate problem with Minetta Tavern. Figure it is a $200 per head night out. You do not get a good steak at Minetta Tavern, but you pay for it, and you expect it. For that quantum of money, you are entitled to a level of food quality somewhere between good and excellent. And the product delivered at Minetta Tavern is between fair and awful. In the end, you leave really disappointed by the food. By comparison, I do not recall ever having been really disappointed by the food at any McDonalds because since I first started eating at McDonalds, I have known precisely what to expect. And having eaten in McDonald’s on three continents, I can say that a Big Mac always tastes exactly like a Big Mac. And who doesn’t like a Big Mac? So, even if we are all big saps, is the Big Sap model sustainable? In the end, the invisible hand will work. Won’t it? I will say, that the preponderance of pretty women who pack the place are an enjoyable distraction. If you are a man, as you choke your way through the steak, you will enjoy the view. Is that why Frank Bruni liked the place so much? Minetta Tavern – the best steak house in New York if you like looking at pretty women. If you do not like steak. Ok, members of the Nobel Committee, go ahead and announce my award whenever you are ready. Hugh occasionally favors ME LIKE EAT with his insights and analysis of some of the finest food in New York City. If you enjoyed this column, you may also want to take in his thoughts on Nougatine and the State of Nature, what lies at the Heart of Babbo, what it’s like Dining With Mark at Yankee Stadium, or his thoughts on Hot Dogs, Pizza and New York. There are so many terrific joints like Beppe and Tabla which get killed. It’s upsetting to know that somehow Minetta Tavern survives with places like those in mind. I really liked Beppe. Or how about the Bar at Etats Unis? I like your theory though, which might explain why the place is filled with so many great looking women: they don’t eat! So go to Minetta Tavern. Just don’t eat.